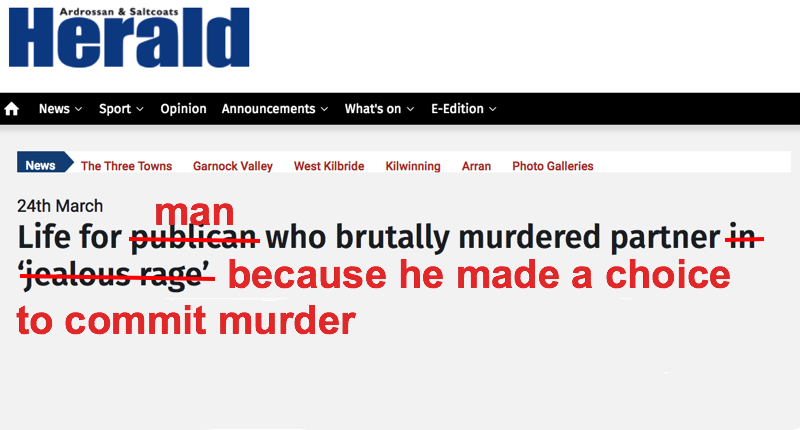 The Ardrossan and Saltcoats Herald reported that Mark Tindill, 56, pleaded guilty to murdering his girlfriend. The headline ascribes this to a “jealous rage”. Research by Australia’s National Research Organisation for Women’s Safety shows that when it comes to reporting men’s violence against women and children, the media tend to sensationalise stories, perpetuate myths, excuse perpetrators, blame victims, and fails to recognise the broader social context of domestic and sexual violence. That’s a pretty long list of injuries to public understanding of violence against women. “The way news media frame a story about violence against women can have a powerful impact on the way the public understands the issue. Who or what is selected to appear in the news and how those individuals and events are portrayed matters. Journalists have a responsibility to themselves, their profession, their readers and the victims of crime to report ethically on men’s violence against women. Sensationalising a young woman’s murder is not fulfilling that responsibility.